This report calculates and displays the net profit of the organization for the required period. In this widow, fill in the required dates for the report (mandatory fields) and define whether to display the list of accounts and their numbers. 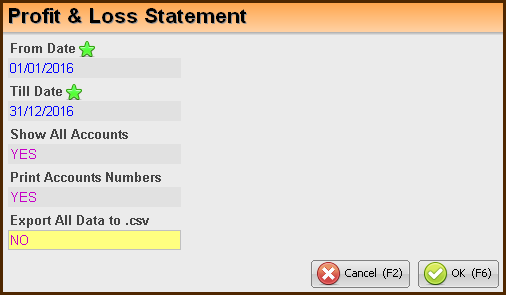 Alternatively, the total summary of the accounts will be displayed without the accounts details. The Profit & Loss Report displays the Income and the expenses. At the bottom of each of the report sections (income / expenses), the total amount summary is displayed. The Net Profit for The period is displayed at the bottom of the report.